Here’s a wee plant that I just adore: Saxifraga ‘Star Blush’. It’s a little cold-hardy perennial that forms a charming mound of succulent green foliage. 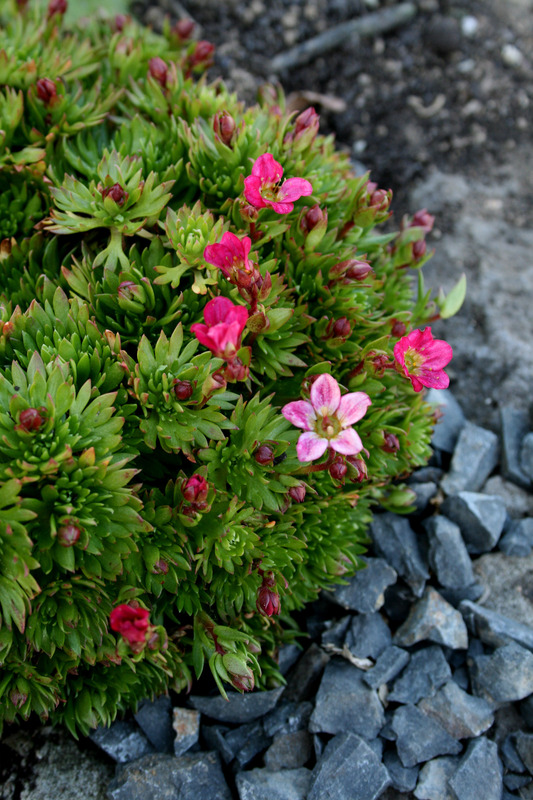 It has that same cushion shape and form as our native scleranthus, but it’s topped with beautiful, star-like pink flowers that start out as hot pink buds and, once open, fade to pale pink. It’s absolutely gorgeous in a hypertufa pot, or between rocks in a rockery, or snuggling up to the edge of a stone wall. In my city garden, I planted it in little groups in the gravel path at the front of my section. I thought it would look cute – like something out of an Enid Blyton storybook – and it did. Until I opened my garden the public. Turns out that garden visitors tend to look up instead of at their feet: my plants all got stood on and squashed. So this time around, I’ve planted them at the edges of the low stone walls at the end of our lawn. The dog might bound over the top of them, but they’ll soon bounce back. Saxifraga ‘Star Blush’ is available from garden centres, though you might need them to order it for you. (My plants came from the Waikato wholesale nursery Growing Spectrum).